You can create a page report with a chart using the ActiveReports Chart data region. 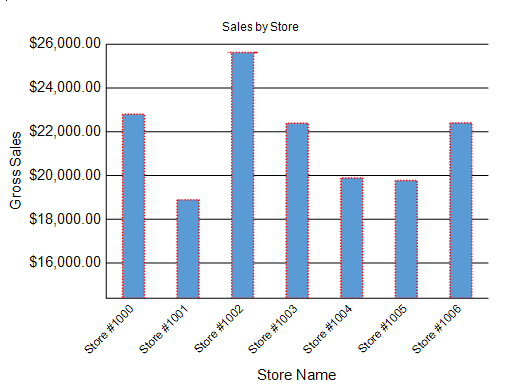 This walkthrough illustrates how to create a simple report with a Column chart. This walkthrough uses the StoreSummary table from the Reels database. By default, in ActiveReports, the Reels.mdb file is located in the [User Documents folder]\GrapeCity Samples\ActiveReports 13\Data folder. In the New Project dialog that appears, select ActiveReports 13 Page Report Application and in the Name field, rename the file as rptSalesByStore. In the Report Data Source Dialog that appears, select the General page and in the Name field, enter a name like ChartData. In the Report Explorer, right-click the ChartData data source node and select the Add Data Set option or select Data Set from the Add button. In the DataSet Dialog that appears, select the General page and enter the name of the dataset as StoreSummaryData. This name appears as a child node to the data source icon in the Report Explorer. Click OK to close the dialog. Your data set and queried fields appear as child nodes to the data source in the Report Explorer. 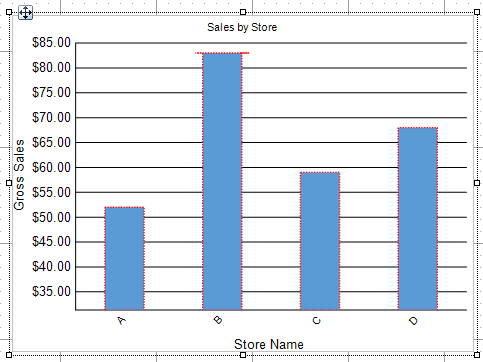 In the Select a Chart Type wizard that appears, select the chart type Column. Go to the Properties Window, click ellipses button next to Plots property to open the PlotDesigner Collection Editor. You see that Plot1 is already added. Select Plot1 and click ellipses next to go to Encodings>Values property to open the DataFields Collection Editor. Add a field and set its value to expression =Fields!GrossSales.Value. Click OK to save and return to PlotDesigner Collection Editor. Go to Encodings>Category>Values property and click ellipses next to Values property. Add a field and set its value to expression =Fields!StoreName.Value. Click OK to save and exit expression editor and then again to close the collection editor. You see that 'Store Name' is added to Category Fields and 'Gross Sales' is added to Data Fields. Select Chart and set Pallet to Office. Select 'Chart title' on the chart and set Title to 'Sales by Store'. Select the chart plot and set following properties. Select X-axis and set Labels>LabelsAngle to -45 degrees. Select X-axis and set Title>TitleStyle>Padding>Top to 8pt. Select Y-axis and set Title>TitleStyle>Padding>Right to 4pt. Size of the chart so that all labels are displayed correctly. Select Chart and set Size property to a larger value. Page size of the report so that the chart is fully rendered. Select Report and set PageSize property to a larger value.